Hope this finds you well. Mia’s Closet has had a fabulous 2015 so far! We’ve hosted two vision board workshops, just confirmed the date for our Prom with Mia’s Closet Workshop with Macy’s, and we’re one of the beneficiaries of the Bayou City Professionals Women in Power event. We’re also pretty pumped about our new partnerships with the social change group Alibi X, and the Emery/Weiner Day School. Things just keep getting better and better! A dear friend and supporter of the organization, Ahrif Sarumi -founder of the super successful pop-up dinner series Aces of Taste, just announced that they will be launching a pop-up brunch series this Saturday, and Mia’s Closet has been selected as the beneficiary! To say the least, we have A LOT to be thankful for, and we’d love to celebrate with you! 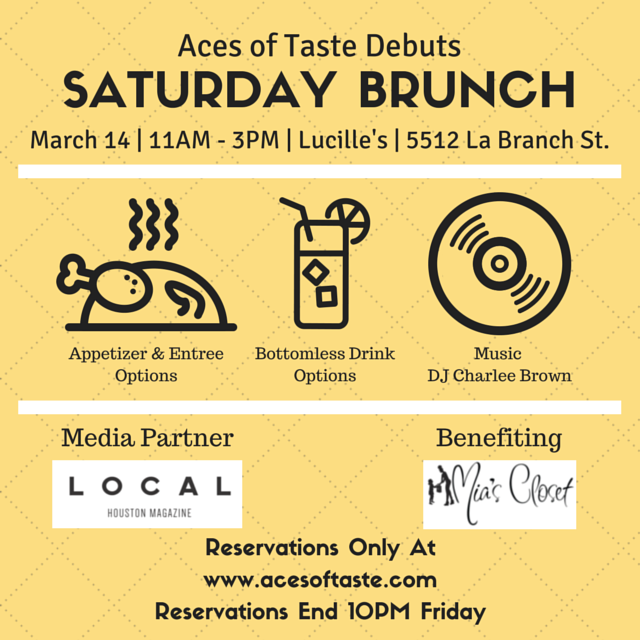 Join us on the patio of Lucille’s, in the heart of the Museum District, for an afternoon full of food, specialty cocktails, curated music by one of our favorite DJ’s, DJ Charlee Brown, and a couple of surprises, courtesy of the Aces of Taste team! -That warm & fuzzy feeling after supporting a great nonprofit organization! Make your reservations HERE before 10PM on Friday. Can’t attend, but would like to make a contribution? We warmly accept your donations HERE. So looking forward to brunching with you guys! « Volunteer Opportunities December 2014: Christmas with Mia’s Closet!